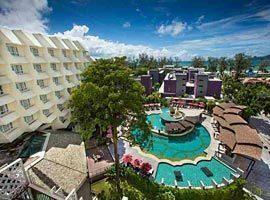 Welcome to your gateway of affordability for the best 4 star resorts in Phuket Thailand. If you expect to be wrapped in exotic beauty in a choice of accommodation options with affordable price tags such as hotels with pool access rooms found at places like The Kee, Kata Palm and Holiday Inn, enjoy your own pool at Centara Villas or the best places for families like Double Tree Hilton and Centara Karon Beach Resort featuring facilities such as water slides and kid clubs, then these places will delight your senses. Not only will you find a wide range of 4 star accommodation, but booking with us is a sure fire way to guarantee big savings. 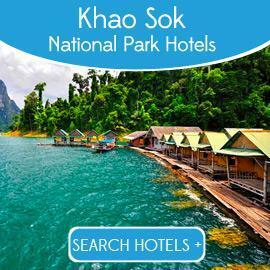 Choose from the list of hotels below or search more places to stay using in the yellow search box. When you insert your dates we provide an up to date list of prices and the latest special offers which include book now pay later offers and free cancellation deals. 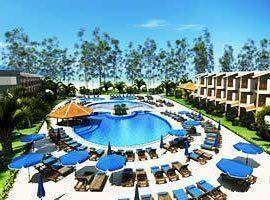 Not sure if the resorts you prefer will be in a location you are guaranteed to enjoy? 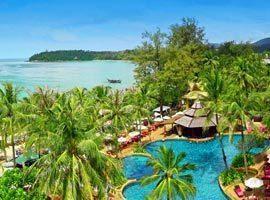 We suggest reading our rendition of the best places to stay in Phuket discussing each area. Choosing your base right is important and will determine how easily you can access the nightlife, if it is quiet and romantic, if restaurants are nearby and if it is a good location to keep energetic teens occupied. Relaxed beachfront location moments from entertainment, near Bangla Road and Jungceylon Mall. New Ocean Wing Suites with 1 and 2 bedroom suites featuring equipped kitchens, living and dining rooms. 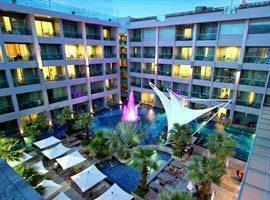 Modern and stylish located a one minute stroll from the beach and 10 minutes walk from nightlife in Patong. Features a swim-up bar and Embrace Suites with ocean view balconies and private jacuzzi. Beachfront resort in Patong featuring direct pool access rooms and villa suite with private pool plus direct access to main pool, heavenly swim-up bar, a shopping plaza and fully equipped fitness centre. 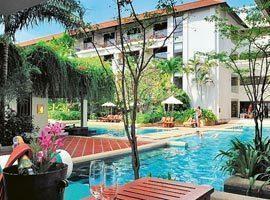 Adults only beachfront hotel located in a private corner of Karon Bay. Features all sea facing rooms with private balconies and beachfront pools with swim-up bar. Ground floor rooms with direct pool access. Ideal accommodation for romantic couples escape in a one bedroom pool cabana or honeymoon spa suite with jacuzzi. 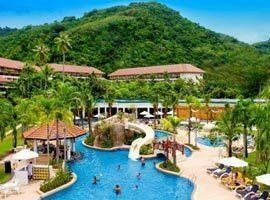 For families it offers a two bedroom suite or cabana, kids club and kids water slide. 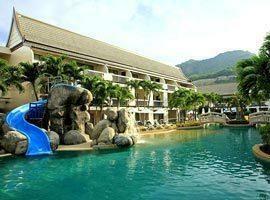 Great place to stay with kids in Kata Beach offering deluxe family rooms and suites. 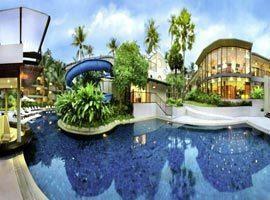 It features three pools with aqua beds, adjoining jacuzzi, swim-up bar and kids pool with water slide. Located on a hillside overlooking Karon Bay the resort offers ideal honeymoon accommodation in spa villas and private pool villas. 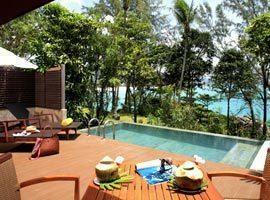 Deluxe sea view villas have private balconies with sweeping ocean views. DoubleTree is located in Surin, steps from the silky sand and features a beach club, family friendly facilities including a water slide and kids club. Book a King Terrace Suite with direct pool access. 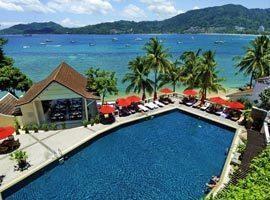 Featuring a stunning beachfront pool, swim-up bar and spa in Kata. Offers deluxe sea view rooms, grand pool access rooms and a large junior suite with separate living room. Ideal for couples and families. 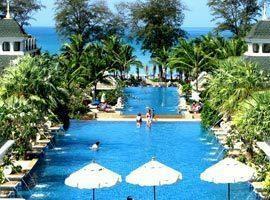 Offering a kids club, fitness centre, spa and accommodation directly on the beach in Patong catering to every requirement. Features a 2 bedroom family suite, ocean views rooms and rooms with pool access. The ultimate 4 star hotel if you are traveling with small children. Accommodation include thoughtful extras like high chairs, baby cutlery and more. Baby studio is made extra safe and family studio offers space. The Kee is located near the action packed nightlife scene in Bangla Road in Patong. It offers trendy accommodation in rooms with private balconies and a divine spa offering specialized treatments.